Louis XIV (Louis the Fourteenth) is one of the most well-known and was one of the most powerful of the Kings of France. Famous for his big hair and residing in the rather large and grand Palace of Versailles with other members of the aristocracy, his rule came at a time of France's supreme power. Here are ten facts about King Louis XIV of France. Louis XIV was born on 5th September 1638 and died on 1st September 1715, four days before his 77th birthday. Louis XIV holds the record of being the ruler for the longest period of time of any of the major European monarchies. He ruled France for 72 years, 3 months and 18 days. Johann II, Prince of Liechtenstein, had the second longest reign, of 70 years and 91 days between 1858 to 1929. He is followed by Franz Joseph I who was Emperor of Austria and King of Hungary from 1848 to 1916 (68 years), and fourth is Queen Elizabeth II, who has reigned since February 1952..
Louis XIV became King at the age of four in 1643 after the death of his father, Louis XIII (Louis the Thirteenth). As he was still a little nipper at the time, his mother Anne of Austria carried out ruling duties, assisted by Cardinal Jules Mazarin, who was chief minister of France. Louis XIV took charge in 1661 after the death of Cardinal Mazarin. By then, he was 22 years old. The American state of Louisiana is named after Louis XIV. It was under French control between 1682 to 1763 and again from 1800 to 1803 and was known as La Louisiane (Land of Louis). After he had died, it was found that Louis XIV's stomach was twice the size of a normal human being's stomach. He liked to eat! Louis XIV was often known as the Sun King. In the same way as the planets revolve around the Sun, he wanted his courtiers and the people of France to revolve around him. Louis XIV was a generous King but you had to earn favour by flattery and waiting on him. He encouraged members of his court to live extravagant lifestyles, and to spend money freely. Once they had spent more than they had, they would come to rely on the generosity of the King to keep them in the lives that they were accustomed to. And to do that, they would have to heap praise and flattery on him! It is often claimed that Louis XIV only bathed three times in his life. In fact, Louis XIV was an incredibly clean King who bathed regularly in a large Turkish bath in his palace. He disinfected his skin with spirits or alcohol and changed his clothing (especially his underwear!) numerous times a day. He also insisted on having his clothing perfumed with a variety of fragrances and scents. 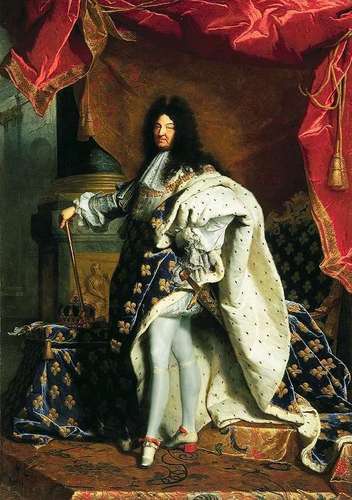 Pictures of Louis XIV often show him in high heels with big hair. This was simply to make him look taller. Louis XIV was only five foot, four inches tall. But, when wearing his heels and one of his 1000 wigs, he would appear almost 7 feet tall. Louis Louis Louis Louis! The name Louis seemed quite popular at the time. Louis XIV's father was Louis XIII (13), and it seems that Louis XIV was determined to ensure that the next King of France was also a Louis. Heirs to the throne - Louis XIV's eldest son, eldest grandson, eldest great-grandson - were all called Louis, the latter succeeding Louis XIV to become King Louis XV (the fifteenth). The successive Kings of France were Louis XVI (the sixteenth, and Louis XV's grandson) and Louis XVIII (the eighteenth, and another of Louis XV's grandsons). What about Louis XVII (the seventeenth) I hear you ask? That's a bit of a messy one. Louis XVI predictably had a son called Louis, who was heir to the throne, but as Louis XVI's death signalled a temporary end to the French monarchy, his son never actually ruled. Even so, he was still seen as King Louis XVII by those refusing to accept the idea of France being a republic. After his death at the age of 10 while in prison, his uncle Louis XVIII was next in line to the throne. At the time, the throne still didn't exist, but following the restoration of the monarchy in 1814, Louis XVIII became the official King of France.